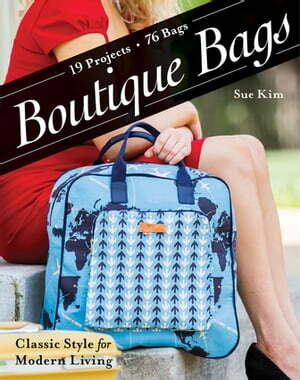 Collins Booksellers - Boutique Bags by Sue Kim, 9781607059868. Buy this book online. Hit the town with chic, modern bags for any occasion! With 19 fashionable projects, from a metal-framed clutch to a ruffled carryall, you’ll have a match for every outfit. Learn to sew darts, ruffles, and other design elements for a professional finish. Make multiples of your favorites and see for yourself how a simple change in fabric offers a whole new look. With full-size patterns and simple construction, these bags are on-trend and runway worthy.